SQA had a presence at a recent event called The Gathering 2017, held at the SECC, where organisations from the third sector had the opportunity to network, showcase what they do and learn from each other. 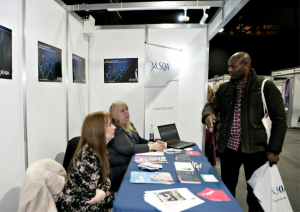 As one of the exhibitors, we took the opportunity to showcase our free Digital Learning Guides as a resource for third sector digital learners. The event kicked off with a special address from the First Minister of Scotland, Nicola Sturgeon MSP. There were over 100 exhibitors in the ‘marketplace’ alongside a packed programme of events featuring more than 50 workshops, seminars and training sessions. Key themes included Brexit and the third sector, digital participation and funding. Added to that was the Gathering theatre, where live interviews with key speakers drew big audiences throughout the two days.